UC Davis collaborator Abou with children in Sidarebougou. Image courtesy of the Vector Genetics Lab at UC Davis. People always gripe about how scientists waste time studying useless, obscure topics. I’ve spent my career studying the species Anopheles gambiae, whose name literally means “useless” in Greek. But it also happens to be the deadliest animal in the world: its other name is the African malaria mosquito. It may be a useless pest, but understanding it is critical to fighting malaria. This is a story about how basic research on genetics and ecology ended up being integral to understanding how malaria control played out in the field. An. gambiae isn’t the only mosquito that can transmit malaria, but they are definitely the best at it. They’ve coevolved with humans—unlike most other species, An. gambiae prefers to feed on humans and rest inside houses. They’re also remarkably adaptable, and have split into sister species that to fill different niches across Africa. The members of the Anopheles gambiae complex all look identical, but each have their own traits: An. arabiensis are drought tolerant, and can feed on cattle when they can’t get at humans. The eggs and larvae of An. melas and An. merus can survive in brackish saltwater on the coasts, An. bwambae grow up in hot springs, and An. coluzzii tends to breed in man-made habitats like flooded rice fields. Despite their different adaptations, they’re so closely related that you can only tell them apart with genetic techniques. And knowing what species you’re dealing with is important, because some interventions work better against some species than others. The biggest one: pyrethroid insecticides. Pyrethroids are one of the best tools we have to fight against malaria. They’re a group of synthetic chemicals based on pyrethrum, a natural insecticide found in chrysanthemum flowers. They’re cheap to produce, quickly kill mosquitoes by inactivating the sodium channels in their neurons, yet are so nontoxic to humans that you can put them on a bed net used to protect a baby. In fact, they’re the only kind of insecticides that are safe enough to use on bed nets. They give the nets an extra boost, killing mosquitoes that land on it, and preventing mosquitoes probing for holes to enter the net. Yet, there’s a weakness: pyrethroids kill mosquitoes so efficiently that any mosquito that can survive exposure to them has a huge advantage. Like overuse of antibiotics, overdependence on pyrethroids (both in agriculture and in public health campaigns) has selected for pyrethroid-resistant mosquitoes across the continent of Africa. Resistance has emerged independently in many mosquito species, and in other pests like bedbugs and cockroaches. There are even multiple kinds of resistance: some populations have a mutation in the neuron’s sodium channel, some have thickened cuticles to keep insecticides out, and some overproduce detox enzymes that break down insecticides. This is such a huge problem that it cannot be understated: if pyrethroids become useless against mosquitoes, we will have lost one of the best tools we had to fight malaria. The WHO estimates that losing pyrethroids could lead to 120,000 more malaria deaths every year. Back to basic research: the Lanzaro lab at UC Davis studies the population genetics and speciation of An. gambiae. One of our research sites is in southern Mali, which has several sister species—An. coluzzii, An. arabiensis, and two subspecies of An. gambiae sensu stricto. One of our research questions was what drives speciation, particularly between An. coluzzii and An. gambiae. They’ll easily interbreed in the lab, but in the wild you rarely find hybrids, even when both species are in the same villages at the same time. One hypothesis is that these two species are so well-adapted to their particular ecological niches that their hybrid offspring can’t easily compete in either niche. While genetically analyzing old samples from Mali, we found something interesting—in the village of Selinkenyi, every once in a while, hybrids would suddenly appear, then disappear in subsequent years. No one had ever seen this before, and the only reason we did was that we were lucky enough to have an archive of preserved specimens going back 20 years. The most likely explanation is that something in the ecology changed and briefly allowed hybrids to survive. After this short episode, selection pressures came back, the hybrids died out, species boundaries were reestablished, and there was no evidence in the genome that they ever interbred. In 2006, though, something interesting happened. There was another burst of hybrids, but this time it permanently affected An. coluzzii. After the hybrids disappeared, a large chunk of the An. coluzzii chromosome 2 was replaced with An. gambiae genes. This mutation started spreading, and soon most of the An. coluzzii across Mali had the An. gambiae section swapped out for their own. If these mosquitoes were so exquisitely adapted to their own niches, what could they want with a bunch of genes from another species? It turns out that they needed these genes to survive. In the middle of the new section was the gene for the neuron’s sodium channel, the target of pyrethroids. An. gambiae in southern Mali had developed a resistant variant decades earlier, likely in response to agricultural use of pyrethroids on cotton. When pyrethroid-treated bed nets and indoor residual spraying were introduced for malaria control in the 2000s, resistance started increasing. Meanwhile, An. coluzzii had remained completely susceptible. When hybrids appeared in 2006, some inherited the resistant variant from their An. gambiae parent, while some inherited a susceptible copy. The susceptible ones died off, as normal, but the ones with the resistant variant had a new weapon that helped them circumvent the pyrethroids that were keeping them from feeding on people. They survived and reproduced, and the resistant gene was able to hop from An. gambiae into An. coluzzii. This is one of the best examples of “adaptive introgression”, where a beneficial gene moves between species. This is rare in animals, but actually happens frequently in plants, which are more likely to hybridize. Genes constantly mutate at random, and most mutations are harmful. It can take a long time for a new, helpful mutation to appear. Why try out a bunch of random mutations by trial and error, when you can grab a pre-tested mutation from another species? It’s even better if you can get a whole cassette of mutations that work well together. In the case of An. coluzzii, we know that at least two resistance mutations hitched a ride from An. gambiae. Does this mean malaria control is doomed? Pyrethroid resistance is definitely in on the rise. Even without adaptive introgression, the selective pressure is so high that pyrethroid resistance would have emerged in An. coluzzii sooner or later. However, resistance is a continuum, not an on/off switch. Resistant mosquitoes can survive a short dose of pyrethroids, but they’re not invincible. Recent studies show that pyrethroid-treated bed nets are still protective and help prevent malaria, even if they don’t work as perfectly as they used to. However, that doesn’t mean we should sit back and watch resistance get worse. Luckily, there’s been a push to increase entomology surveillance and resistance monitoring across Africa, which can help us make proactive decisions. Right now we don’t have any other options for bed nets, but interventions like indoor residual wall spraying are more flexible. In Mali, entomologists doing routine surveillance saw increasing pyrethroid resistance, and advocated to switch from pyrethroids to newer organophosphates for wall spraying. The problem, though, is that organophosphates are eight times more expensive than pyrethroids, can’t be used on bed nets, and it’s only a matter of time before resistance develops to them, as well. 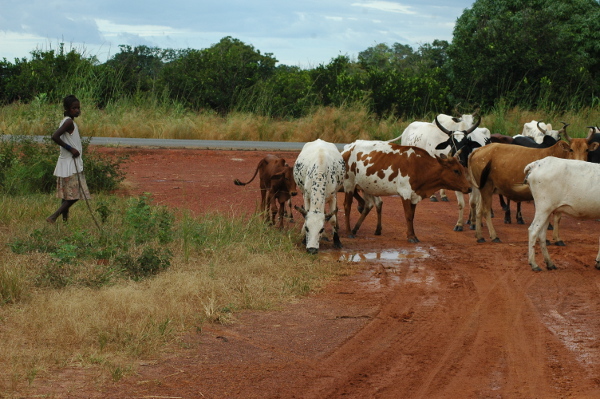 A girl herding cows in Pimperena. Image courtesy of the Vector Genetics Lab at UC Davis. What’s the long-term solution? As a community, we need to invest in developing safe, new insecticides for public health, so that malaria control programs have options to switch to when resistance develops. It’s well-known that rational, strategic use of insecticides, using methods such as rotating insecticides, can help prevent insecticide resistance. We’ve always been one step behind, though—there are never enough good options, so we rely on using just one intervention. We also need to develop new options that are less reliant on insecticides. There are a number of new tools that are still in proof-of-concept stage: new insect repellents; genetically modified malaria-resistant mosquitoes; modified bacterial symbionts that live in mosquito stomachs and prevent malaria infection (also known as paratransgenesis); attractive toxic sugar baits that lure mosquitoes in for a sugar meal and kill them; naturally entomopathogenic fungal spores that parasitize mosquitoes and kill them before they can transmit malaria; mass drug administration of pharmaceuticals such as ivermectin, which kills both parasitic worms that plague West Africa and has the side effect of killing mosquitoes when they take a blood meal; and more. Ultimately, we are going to need a diverse arsenal, since, despite their name, when it comes to their role as vectors for one of the world’s most important infectious disease, Anopheles mosquitoes are far from useless. Laura Norris did her Ph.D. in Molecular Microbiology and Immunology at the Johns Hopkins School of Public Health, researching how the first-ever bed net campaign in southern Zambia impacted the behavior and genetics of malaria vector mosquitoes. Afterwards, she worked with the Southern Africa International Center of Excellence in Malaria Research, which integrates epidemiology, entomology, parasite genomics, and geospatial analysis to explore risk factors for malaria in Zambia and Zimbabwe. She then did a postdoc at the UC Davis Center for Vectorborne Diseases, using whole-genome sequencing to study ecological speciation and mosquito population genetics in Mali and Tanzania. She’s currently taking a break from research to do a AAAS Science and Technology Policy Fellowship in Washington, D.C. She really does have other interests besides mosquitoes, but they mostly revolve around biking and crafting. World Health Organization (2012) “Global plan for insecticide resistance management in malaria vectors (GPIRM)”, ISBN: 978 92 4 156447 2.